You might have heard that Michael Strahan spent much of his childhood in Germany -- an "Army brat" who barely played any football. Strahan moved to Houston for his senior year of high school, logged a season on the gridiron and earned a scholarship to Texas Southern University, where he ultimately starred. That would be deemed a slow start for any aspiring professional football player, much less a Hall of Fame defensive end. Strahan's pro career got off at a turtle's pace, as well. A foot injury limited his rookie campaign of 1993 to just nine games. Despite starting 15 games in '94, Strahan posted a mere 4.5 sacks. The next year, New York's defense was supposed to be a top-notch unit ... until Dallas stormed Giants Stadium on the season's first Monday night and rocked Big Blue 35-0 in front of a national television audience. Throughout that season and the next, though, Strahan began to hold his own, but still only produced a grand total of 12.5 sacks -- not even close to Hall of Fame production for an edge player. Strahan showed potential in these early years, but he was still learning the game and definitely took his share of lumps. Then in 1997, a light bulb seemed to come on under new defensive coordinator John Fox. Strahan got to the quarterback 14 times and earned first-team All-Pro honors. Meanwhile, Big Blue rode its defense to a playoff berth. The guy who barely knew the sport had developed into a dominant force. 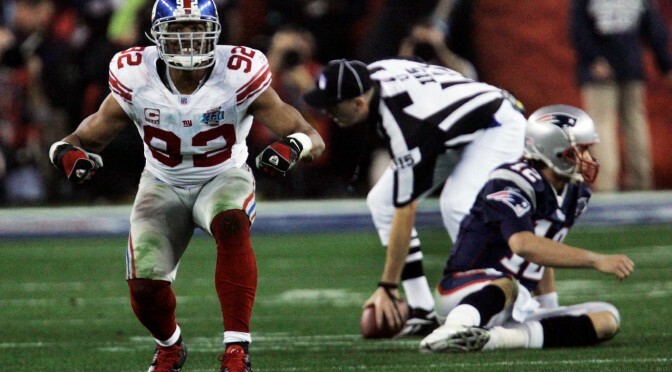 Over the next 10 years, Strahan racked up 109.5 sacks, including an NFL-record 22.5 in 2001 -- a feat which earned him that season's Defensive Player of the Year award. And of course, he rounded out his career by winning a ring in his final game. In 2001, the Rams were a force to be reckoned with. Having won the Super Bowl two seasons prior and boasting one of the most explosive offenses in NFL history -- "The Greatest Show on Turf" -- St. Louis looked like the best team in football. Then Mr. Strahan came to town in Week 5. The big defensive end absolutely terrorized Kurt Warner, Marshall Faulk and Co., crashing the pocket on seemingly every play while helping his defense hold St. Louis to a scant 15 points. Bear in mind, this was a team that had scored 30, 42 and 35 points in the previous three weeks, and would go on to score 34, 31 and 48 over the next three. No matter. Strahan gave Warner no time to breathe, racking up four sacks on the day, including a huge, fourth-quarter strip-sack that put New York's offense in position to take control of the game. Unfortunately for the Giants, that didn't happen. And ultimately, Strahan's Herculean effort came in vain, as the Rams squeaked out a 15-14 win to improve to 5-0. St. Louis went on to finish the regular season with a league-best mark of 14-2 and made it all the way to Super Bowl XXXVI (where they suffered an upset loss to the Patriots). But on that day 13 years ago, Strahan was the best player on the field, authoring one of the most dominant individual performances I've ever seen. Being a great pass rusher is about more than talent, technique or having a "high motor." It's as much about adjustment as anything: adjusting to different offensive tackles, adjusting to quarterback tendencies (Does a guy pat the ball before releasing? ), and in some cases, adjusting oneself. I was always impressed with how Strahan shed over 30 pounds late in his career in order to get quicker. At 255 -- as opposed to somewhere in the high-200s -- the 30-something Strahan was able to get around the tackle and after the quarterback. Not a lot of players were doing that circa 2005. Yet, guys like Strahan and Jason Taylor paved the way for some of the svelter pass rushers we see these days. When you pore over Strahan's career résumé, his sack total jumps off the page. He compiled 141.5 of them over 14 NFL seasons -- good enough to rank fifth all time. But does that even qualify him to rank as his own franchise's greatest pass rusher? Lawrence Taylor had 132.5 officially, but 142 overall if you count his 1981 season (when sacks were not yet an official statistic, but LT logged 9.5). Strahan is under that number, despite having played in 32 more games than Taylor. That said, as a franchise duo, these two can't be touched -- no other team can boast two players with that many sacks. On the surface, the Vikings' Hall of Fame duo of Chris Doleman (150.5) and John Randle (137.5) looks superior, but over a third of Doleman's sacks came with the 49ers and Falcons.